Matangi Tours takes its name from the Balinese terminology meaning “awake”. Bali is known around the world as a magical island of beauty and tradition and Matangi Tours hopes to awaken this sense of mystical beauty in all of its guests. The founder of Matangi Tours is Jochen Kaufmann. 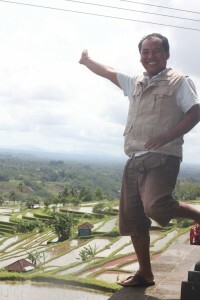 Jochen has been an avid student of local Balinese history for many years and has made Bali his home since 1999. While exploring the island’s most exotic and unspoiled villages, he has developed close friendships with many of the Balinese people and has formed exclusive relationships with some of Bali’s original Royal families. Far away from the noise and controversy, Matangidestinations are an oasis of peace, full of tasteful, cultural adventure showing Bali as it has remained unchanged for 100’s of years. Not wanting to keep all this knowledge of fascinating locations and all of these personal contacts to himself, Jochen started bringing his friends and V.I.P.’s with him to share in some of Bali’s most incredible adventures. And so Matangi Tours was born in 2000. In just the last few years theMatangi Tour has gone from “Bali’s Best Kept Secret” to the Islands most sought after daily event. Guests can choose from a select variety of unique daily tours. Matangi Toursarranges its schedule around the village activities and limits their tours to smaller numbers. One of the highlights of the Matangi Tour is when we are invited to the private homes of our many Balinese friends. Something very special often happens in the village settings of these cross cultural events. Matangi Tours lunch hosts and friends are growing organic food in their gardens in the Regency of Karangasem. In a joint effort, waste is being recycled in order to participate in the education of the local people to better preserve the island’s natural beauty. Matangi Tour guides are knowledgeable, courteous and friendly. They speak English, German and Indonesian. Guests receive door-to-door service in modern and very comfortable air-conditioned cars. Routes and destinations are renewed and updated on a regular basis as we continue to explore for additional amazing people and places. Personal requests are always considered and no two tours are ever quite the same.